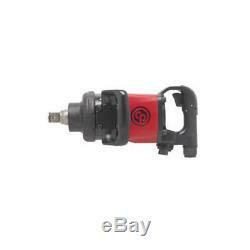 Chicago Pneumatic CP7782 1-Inch Drive Lightweight Heavy Duty Air Impact Wrench. The Chicago Pneumatic 1 in. 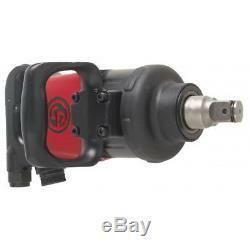 Heavy Duty Impact Wrench with 6 in. Anvil delivers superior power for the toughest jobs on truck, bus, and heavy equipment applications. Of maximum torque in reverse and a regulator with integrated forward reverse with 3-position power settings in both directions, this tool combines both power and control for maximum efficiency. Along with its efficient motor, this high torque impact wrench is economical with a durable reinforced clutch mechanism and has an ergonomically designed side handle. Of maximum torque in reverse for ultimate power. Pinless closed reinforced rocking dog impact mechanism. Ergonomic side handle for operator comfort. Socket retainer ring combined with hole retainer. Full teasing trigger for greater control. Regulator with integrated forward/reverse with 3 position power settings in both directions. What's in The Box. 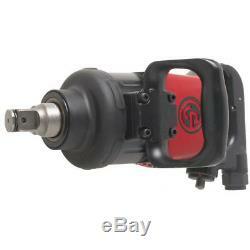 Heavy Duty Impact Wrench - CP7782. 370 - 1,475 ft-lbs. SECURE & HASSLE FREE SHOPPING. All our sales are backed by a 30-Day Satisfaction Guarantee. Products shown as available are normally stocked but inventory levels cannot be guaranteed. The item "Chicago Pneumatic CP7782 1-Inch Drive Lightweight Heavy Duty Air Impact Wrench" is in sale since Wednesday, December 9, 2015. This item is in the category "Home & Garden\Tools\Air Tools\Wrenches". The seller is "factory_authorized_outlet" and is located in Ontario, California. This item can be shipped to United States, Canada, United Kingdom, Denmark, Romania, Slovakia, Bulgaria, Czech republic, Finland, Hungary, Latvia, Lithuania, Malta, Estonia, Australia, Greece, Portugal, Cyprus, Slovenia, Japan, China, Sweden, South Korea, Indonesia, Taiwan, South africa, Thailand, Belgium, France, Hong Kong, Ireland, Netherlands, Poland, Spain, Italy, Germany, Austria, Israel, Mexico, New Zealand, Philippines, Singapore, Switzerland, Norway, Saudi arabia, Ukraine, United arab emirates, Qatar, Kuwait, Bahrain, Croatia, Malaysia, Brazil, Chile, Colombia, Costa rica, Panama, Trinidad and tobago, Guatemala, Honduras, Jamaica.